Socking away money for an emergency fund is one of the first steps to building a financially secure future. Most experts recommend keeping these dollars immediately available, and a savings accounts provides the liquidity to access the cash on a moment’s notice. So which banks have the most deposits on hand? Figuring out the answer to that question led us to create our new map. We adopted a list of the largest banks in each state from GOBankingRates. First, GOBankingRates figured out the largest bank headquartered in each state. Then, we color-coded each one according to each bank’s deposit size within that market—green have high deposits over $50B, but pink states have comparatively small figures, as low as under $1B. We then added the logo of the bank in question. It is important to pause and consider GOBankingRates’ methodology in putting the data together. They looked at official FDIC documents to find the headquarter location and deposit totals from 2017, which can often be different from what one might expect. For example, Wells Fargo has its world headquarters in San Francisco, but the bank’s U.S. operates are actually headquartered in Sioux Falls, SD. Same thing goes for Charles Schwab—the investment company is located in San Francisco, but the bank is kept separately in Nevada. And if you watched the Super Bowl, you know U.S. Bank is associated with Minneapolis. All that being said, there are several interesting surprises in our map. For example, Northfield Savings Bank in Vermont ($681.7B) stands out far and above as the largest bank with the most deposits inside a single market. That’s not a typo—a savings bank nobody’s heard of almost triples the deposits of Wells Fargo. And yes, we double checked the numbers. Wells Fargo is far away in second place with its U.S. headquarters in South Dakota ($264.9B), followed by Bank of America ($171.9) in North Carolina as a distant third place. In terms of general trends, our map demonstrates how almost none of the states with a large bank (over $50B in deposits in a single market) are located in the Midwest. 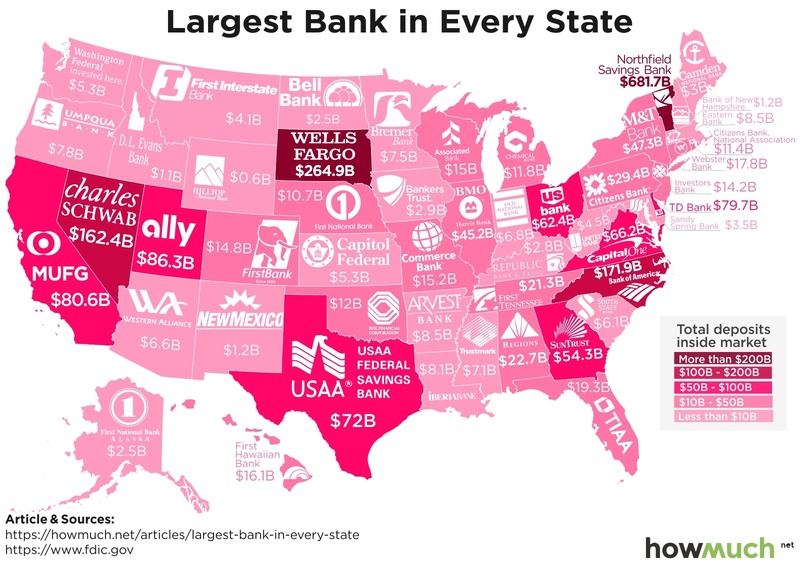 The two exceptions are U.S. Bank which controls the top spot in Ohio ($62.4B) and Wells Fargo in South Dakota—as if South Dakota even belongs in the Midwest. All the other banks headquartered across the country’s midsection are relatively small in terms of deposit size. In fact, the smallest banks tend to be in states with comparably small populations. Wyoming takes last place with the only institution under a billion in deposits, Hilltop National Bank ($0.6B), followed by Idaho with D.L. Evans Bank ($1.1B). Even the First National Bank of Alaska is more than twice as big ($2.5B). If these banks want to grow deposits, they need to move to larger population centers. Here are the ten largest banks in terms of deposits held within a single market ($ billion), together with their total holdings company wide ($ billion). All this goes to show that the world of bank deposits is complicated. Never assume the largest banks are always located in booming metropolises, as Wells Fargo and Northfield Savings Bank demonstrate. And yet the general trend remains undeniable—having a large population only helps to grow the size of a bank’s deposits too. DRUDGE RED SIREN! “Trump sets shock announcement!” UPDATE: Trump to announce 2020 re-election campaign!